Is the iPhone 6S the new best smartphone of 2015? Samsung and Apple are the top dogs of the mobile phone industry right now. If you're looking for the best of the best just look at the flagship releases from either company. The Samsung Galaxy S6 is one of the most popular phones of the year and justifiably so, with its QHD screen, powerful processor, premium design and oodles of features. But if any phone is going to outsell the S6, it will be the iPhone 6S, the latest flagship from the only company in the business that's bigger than Samsung. With a premium design of its own and high-end features it may even be worthy of all the sales it will inevitably enjoy. Why aren't we comparing these two phones I hear you cry? Well, we're about to - here's how the Samsung Galaxy S6 looks up against the brand new iPhone 6S. 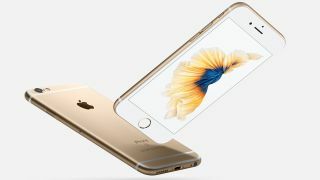 The iPhone 6S is a slim slab of metal, coming in at just 7.1mm thick with very little breaking up the smooth lines of the aluminium build. It looks much the same as the iPhone 6 - there's no design overhaul here - it's just a little thicker to fit in that new 3D Touch screen technology. The Samsung Galaxy S6 is similarly stylish, with a metal frame and a glass back, while at 6.8mm thick it's even slimmer than the iPhone 6S. That glass back is prone to picking up fingerprints though. They're not as visible if you pick the white model, but then you miss out on the gemstone-like finish offered by the other shades. Both phones look gorgeous in the hand though and no-one is going to snort at you in the street if you've got one - unlike maybe if you have a Galaxy S5. There's a 4.7-inch 1334 x 750 IPS LCD display on the iPhone 6S coming in at 326 pixels per inch. That's the same resolution and size as the iPhone 6, making this one of the more compact smartphones around. It's larger than the iPhone 5S and the phones before it so if you're upgrading on a two year cycle it may prove a bit of a culture shock. A lot of people agree that 4.7-inch is the optimum size for a phone though - even for those with smaller hands. The Samsung Galaxy S6 on the other hand has a larger 5.1-inch 1440 x 2560 screen with a pixel density of 577 pixels per inch. So it's both bigger and sharper than the iPhone, but the resolution of the 6S doesn't seem lacking and it certainly helps out on battery life. Both phones offer two of the best displays you'll get on the market though, neither is really likely to disappoint you. At the heart of the iPhone 6S you'll find the brand new Apple A9 processor, designed to be 70% faster at CPU tasks and 90% faster at graphics than the A8 chip in the iPhone 6. It's an impressive set up and beats the iPhone 6 at most tasks. Check out our power comparison video between the iPhone 6S and iPhone 6 - the latter came in 12 seconds faster in our testing. The Galaxy S6 on the other hand has an octa-core Exynos 7420 processor. That includes four cores running at 2.1GHz and the remaining four clocked at 1.5GHz. We put both the Galaxy S6 and the iPhone 6S through some GeekBench 3 testing to get a full look at what each can do. The Galaxy S6 came out with an average score of 4850 – stronger than the iPad Air 2's A8X chip that came in at 4500. The iPhone 6S went through the same rigorous testing and came out the other side with an average score of 4417. A bit less than the Galaxy S6 proving Samsung is better on pure power alone. The Galaxy S6 is a true powerhouse, but while on paper the iPhone 6S may sound lacking in comparison, Apple's phones almost always offer seriously slick performance and the iPhone 6S isn't any exception. Apple has long delivered some of the best cameras found on a smartphone and that's likely to continue with the iPhone 6S, as it has a 12MP main camera and a 5MP front-facing one, both of which are upgrades over what was found on the still impressive iPhone 6. The Samsung Galaxy S6 has a quality snapper too, with a 16MP sensor on the back, complete with optical image stabilisation to avoid blur and a 5MP camera on the front. The S6's camera is one of the best we've tested. The iPhone 6S has brought about a new camera feature called Live Photos. It takes a 1.5 second clip either side of your photo meaning you get a 3 second video to make it to look a little like a GIF. Especially useful for when filming animals and children. The Galaxy S6 doesn't have live photos but it does have a load of modes including the standard auto, slow motion and fast motion. There's also a Pro tool that allows you to play around with elements such as white balance and you can even lock in up to three custom setup. There's also a mode called "Virtual Shot" that means you can create a 360 degree panoramic image from your phone. As for the apps that use the camera, the iPhone 6S is rather simplistic meaning you can just point and shoot what you want whether it's with the front or back camera. Samsung's Galaxy S6 is a little more complicated with lots of camera options going on. If you're big into your photography it's likely a better choice as you can play with all the features, but if you just want a quick snap for Instagram it might not be worth the complications. But there's only really one way to test it - we took both the Galaxy S6 and iPhone 6S for a little walk around our offices trying to get some interesting shots. Here's how those compared. The Galaxy S6 has more detail in some images but still had a few issues with overexposure. The iPhone 6S can look a little dull in some shots, but that selfie camera is far more detailed than the Galaxy S6.